What conditions does Orencia Vial treat? List Orencia Vial side effects by likelihood and severity. Before using this medication, tell your doctor or pharmacist your medical history, especially of: chronic obstructive pulmonary disease-COPD, current/recent/returning infection (such as tuberculosis, hepatitis), immune system disorder (such as HIV infection, bone marrow disorder), diabetes. What should I know regarding pregnancy, nursing and administering Orencia Vial to children or the elderly? Some products that may interact with this drug include: TNF blocking agents (such as adalimumab, etanercept, infliximab). Does Orencia Vial interact with other medications? 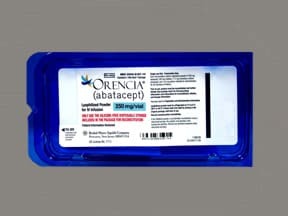 Are you taking Orencia Vial? Are you considering switching to Orencia Vial? How long have you been taking Orencia Vial?